Sarah Owings is a Karen Pryor Academy Certified Training Partner. She specializes in the practical application of behavioral principles to help transform the lives of fearful, shut down, and over-the-top dogs. 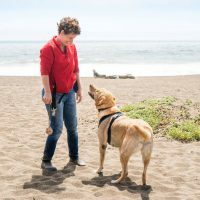 As the owner of Bridges Dog Training, an international speaker, and regular contributor to online training forums, she is known for her innovative approaches to tough behavior problems and her compassionate and insightful teaching. 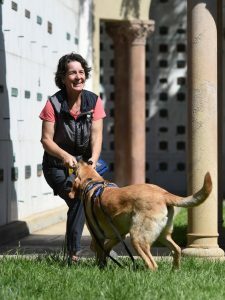 She has written for Clean Run Magazine on topics such as stimulus control, release cues, and toy-related cues, and serves as faculty at ClickerExpo, an instructor for Karen Pryor Academy, and an advisor to the Glendale Humane Society in Los Angeles. She is also an avid nose work competitor, currently competing at the Elite level with her dog, Tucker. She recently moved from Los Angeles to San Rafael, CA with her two dogs, two geriatric rabbits, and her husband Fred. Clean Run Digital Edition of the Magazine (can be downloaded for a small fee). It’s Not a Character Flaw! It’s the ABC’s! Fantastic, Tom! I’d love to hear more about what you learn. Taking extinction off the table opens up so many possibilities for the creative trainer! Thanks for your feedback! Holy light bulb moment! My brain just exploded when Sarah was telling us about her pup’s stimulus control with the ball and barking. I needed this today. Completely brilliant. Thanks, Sarah!! !